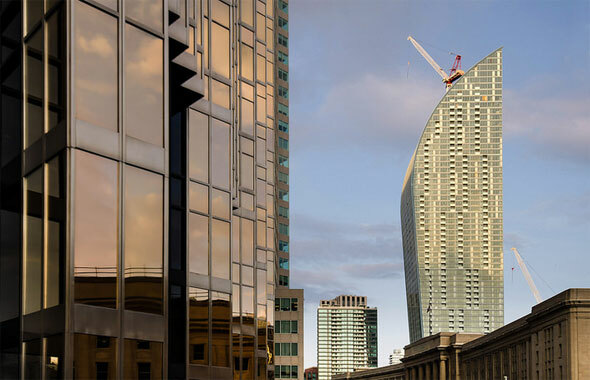 The recent construction boom in Toronto has gifted the city with an array of architectural gems that would be the envy of any world class city. 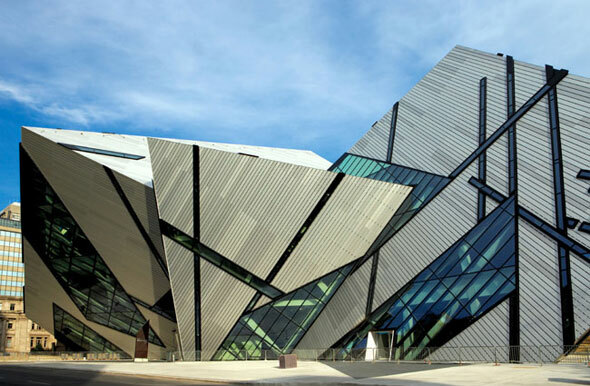 Love them or loathe them, the razor sharp Royal Ontario Museum crystal, the new flatiron building at the Distillery, and Gardiner Museum are becoming famous tourist attractions and important landmarks in their own right. Who knows, maybe in 30 years the modern structures of today will be as famous as the CN Tower, Rogers Centre, or City Hall. Here are my picks for the best Toronto buildings of the last 15 years. Toronto's original flatiron building at Wellington, Front, and Church was built as offices for the Gooderham family, the founders of the Gooderham and Worts distillery, so perhaps the razor sharp building at the corner of Parliament and Mill is a nod to that piece of history. 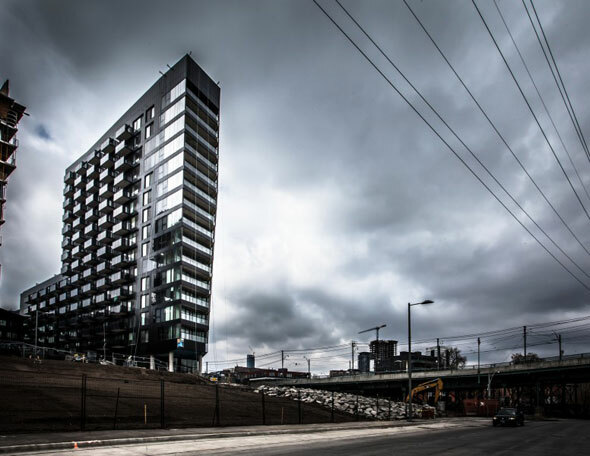 Either way, the building, which also includes a condo tower, has become one of the most recognizable and photographed additions to the revitalized Distillery District. The best thing about the design of the National Ballet School is the ability to peer inside from the street. Like an open jewelry box, practicing dancers on three separate floors are visible to anyone curious enough to cast their eyes upward. "The platforms become stages to the city, while the city is acquired as a backdrop to the dancers in training," KPMB Architects write. 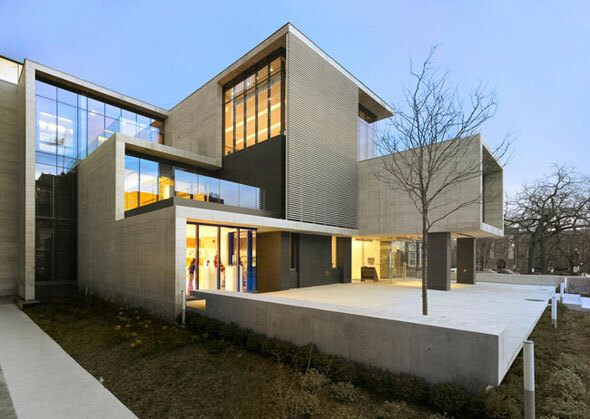 Canada's only museum entirely dedicated to ceramic art got a delightfully modern makeover in 2006. The little modular building, designed by KPMB Architects, tends to be overshadowed by the neoclassical bulk of the Lillian Massey Building next door at Bloor and Queens Park, but it obviously has its fans. This summer it won the Pug Award's "Best of the Best Architecture in Toronto" prize. 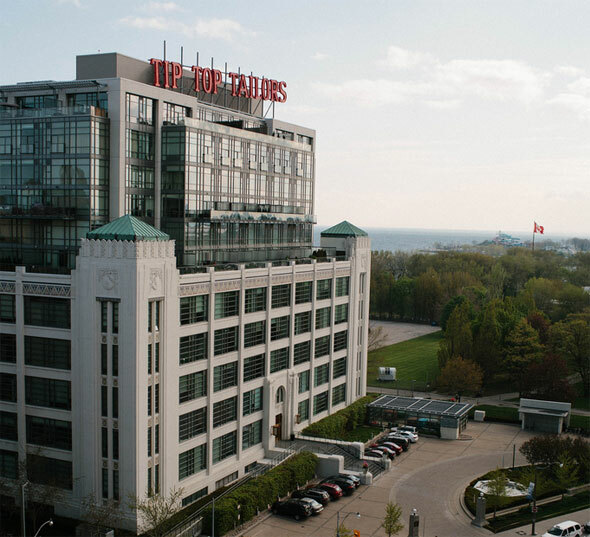 Built in 1929, the original Tip Top Tailor building, along with the postal facility that was converted into the Air Canada Centre, was one of downtown Toronto's best examples of Art Deco architecture. A considerate and discreet residential conversion in 2006 added an extra six storeys without compromising the grand appearance of the former menswear company headquarters. ArchitectsAlliance even kept the famous rooftop neon sign. The Royal Ontario Museum's Lee-Chin Crystal takes a lot of flack, much of it unwarranted. Designed by Berlin-based architect and musical virtuoso Daniel Libeskind, the angular glass and brushed aluminium addition to the 100-year-old institution was completed in 2007 to darts and laurels from the public. Personally, I love it. There's nothing else in the city like it. 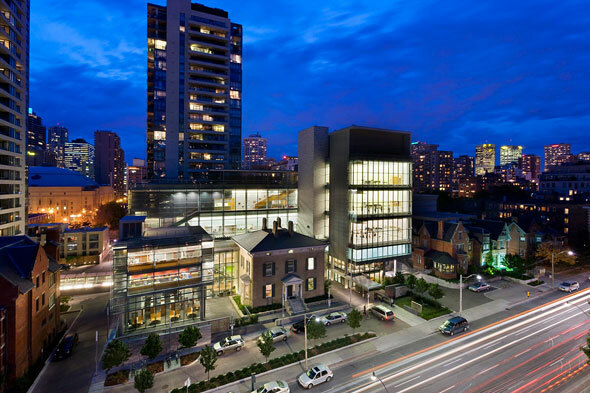 The transformation of the old Don Jail, a place where convicts were hanged until the 1960s, into a modern medical facility saw the addition of a reflective, 10-storey structure that often appears to blend with the sky over the Don Valley and Riverdale Park. 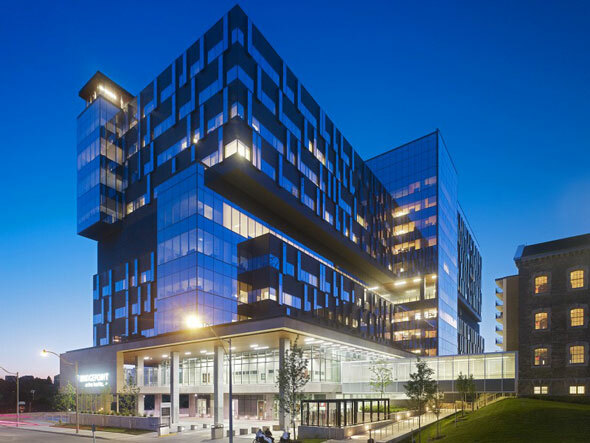 Bridgepoint Health is best viewed in direct sunlight or at dusk. 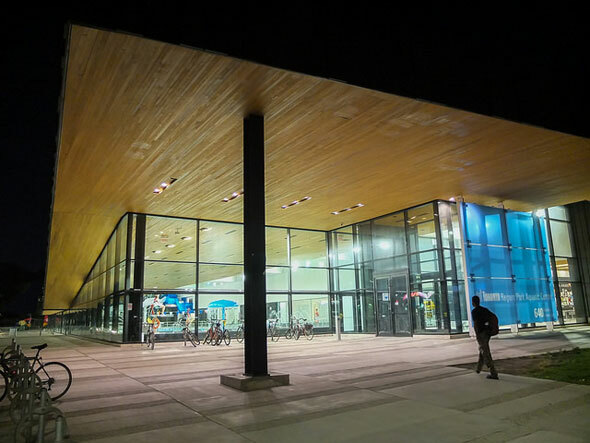 The centrepiece to the ongoing revitalization of the Regent Park neighbourhood, the new $14.7 million aquatic centre is breathing new life into the once rundown post-war housing project. Inside, two swimming pools with large windows open out onto the green space of Regent Park proper, providing an all-important welcoming touch. Globe and Mail architecture writer Lisa Rochon calls the new facility "a beacon of enlightened change" for the area. The first of three buildings to be erected under the River City name in the West Don Lands, the imposing obsidian bulk of the block nearest King St. looks like it could be the headquarters of evil multinational corporation from a dystopian Hollywood future, but in a good way. It's easily one of the best looking condo buildings in the the city. Fort York has been through a lot during its more than 200-year history. Blown up, ransacked by invading Americans, and almost destroyed by the arrival of the Gardiner Expressway, the nucleus around which Toronto was formed finally got its centrepiece this year. 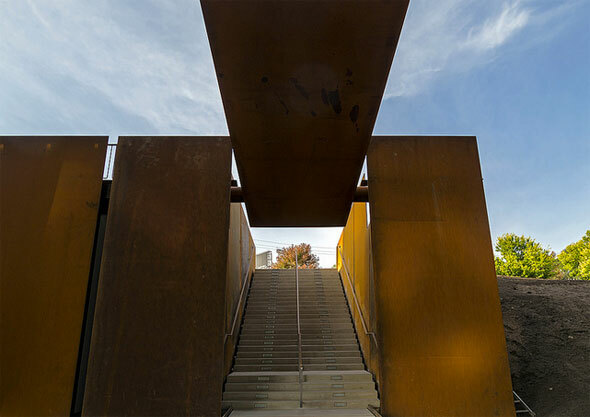 The rust-coloured armoured structure lurks beneath the elevated highway ready to lure new visitors to the increasingly popular national historic site. Another Daniel Libeskind creation, the sweeping 58-storey residential tower that's nearing completion behind the Sony Centre doesn't look half as complex as it really is. In order to create its distinctive curve, complex structural arrangements had to be made behind the building's glazed skin. When it's finished later this year, the L Tower will be a welcome addition to the rigid vertical lines of the Toronto skyline. Image: Yana and Denis, BruceK, Vik Pahwa, Lori Whelan, gable.mak/blogTO Flickr pool.